When I was a kid, there was a local toy store that had a section of ridiculously expensive & exquisite imported toy robots from Japan. 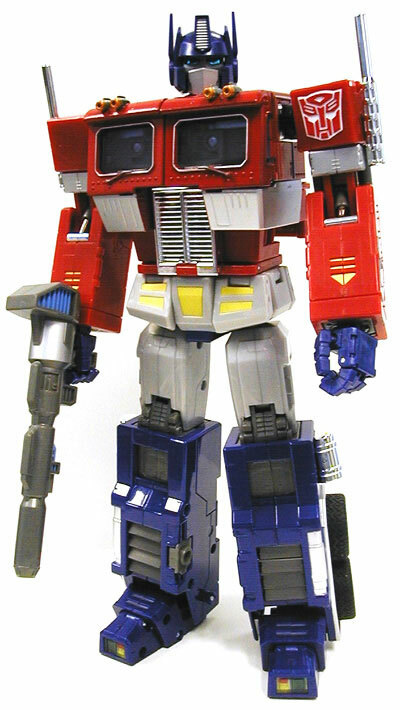 This Masterpiece series Optimus Prime from Takara falls into this category of robot. Made from die-cast metal and plastic he’s as jointed as they come, even his fingers are individually jointed. Included are his Energy Axe, Megatron Gun, and Laser Rifle weapons and he fully transforms from robot to vehicle mode. Plastic trailer also included. He’s heavy too – three pounds! Some things never change – my parents wouldn’t spend $400 on imported robots for me then, and I can’t justify it now either. Or can I?